This is a pretty neat find. Spotted at a local Target in Pleasant Hill, CA. 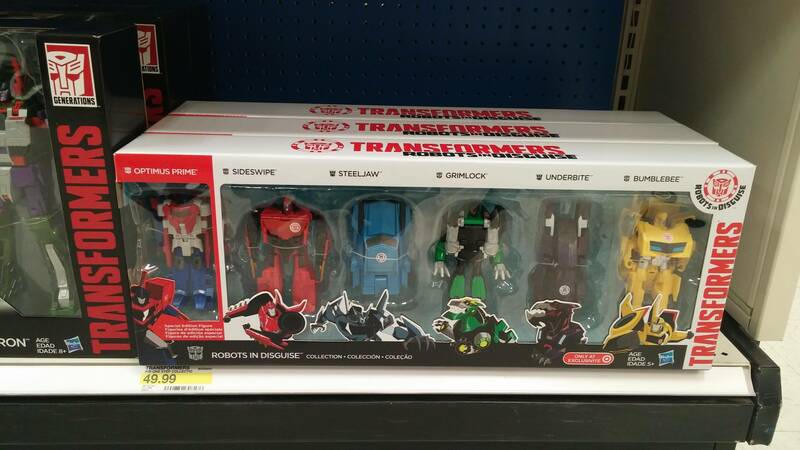 is a Target Exclusive 6 pack of Robots In Disguise One-Step Transformers. In this exclusive set will be: Bumblebee, Grimlock, Sideswipe, Steeljaw, and Underbite, along with a “special edition Optimus Prime” figure. No word yet on if these feature any deco differences from the previously released single packs. Hit the discussion link below to join in on the talk. For assortments, yes. For what should be one-off items, this is kinda unusual. It'd be like, I dunno, considering 2015's Titan Devastator the same item as 2013's Metroplex. But they have been doing it the last few years with their exclusives. These to EZ tf sets are one example, the Marvel Legends 3 packs are another. I don't follow enough toylines to know them all, but its been like that for a few years now. Really and truly, when near-on every part of a toy is changed and all that remains the same are the hinges and the transformation scheme, would we still even call it a remold? The extensiveness of some remolds leads me to question the point the line would be drawn at. The term you're looking for is "reshell". Keeping the engineering but changing most, if not all of the detail tooling. Yes, it indeed looks like a major remold, as the hinges seem to be the same, but the legs, arms and abdomen are completely different. Target always uses the same DCPI for multiple items. This is not new. They have this set at my local store, too. Target really seems to think this the same product as the AOE six-pack, if their website is any indication. Soon to featured in the Clearance End Cap. Oddly enough the ones in the Target by me were stickered 'as is' @ $13.99. Couldn't help picking one up at that price. I saw this set at Target the other day.so it's hit our area. (Imitating Rainier Wolfcastle): Upon closer inspection, that Prime appears to be a re-tool of AoE Prime. Have we seen that Prime figure before? 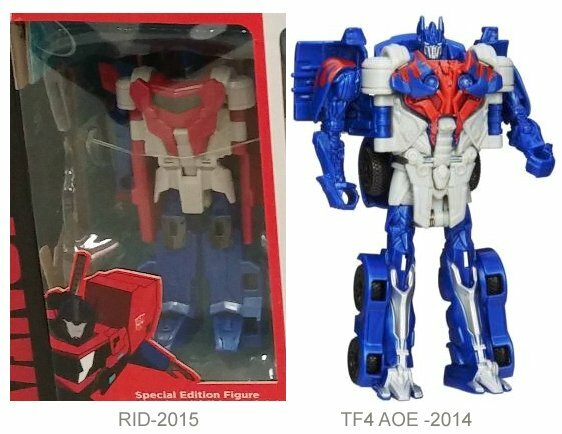 At least with last year's 6-pack it was just a redeco of Optimus, but this time it is a new mold… that you'd hope would be released on its own, but after seeing various Megatronus toys being exclusive to ToysRUs, who knows anymore. Looks like we have our first Target Exclusive which is a rereleased set of 1-Step changers, with a special edition Optimus figure. Saw this set at a Target in Pleasant Hill, CA. How creative of them. Lol the same idea as the Age of Extinction pack. That's still at my local targets. Hasbro: "Oh hey, I know…let's take all of the One-Step's nobody is buying and shove them in a giant expensive gift set like that AoE one that nobody is buying." Target: "Okay thanks I guess?" So many baffling decisions from Hasbro….so little time. Remember when they did multi-packs with Deluxes and Voyagers? We haven't had any really good multipack exclusives in a while. Nice marketing ploy to get kids/fans to buy Optimus. They make you buy 5 other shelf warmers too. Pffft! That's odd. The one steps and Warriors I've seen have been flying off the shelves. We may be getting close to AoE Multipacks if Target gets desperate enough to clear out their Snarls and Lockdowns. Because right now they're plan is to raise the price to $17.99, which seems counter-productive to that cause. Is that Optimus gonna be released separately? Oh no, not another one of these sets to take up lots of space and never sell. These toys look terrible for the price.